Two of my friend gave birth to a healthy baby boy and a baby girl this month. I know it will be an exciting moment for the two of them. 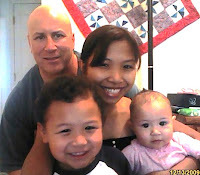 I missed having a baby but my husband and I only want to have 2 kids, so Dustin and Dana is enough for us. We are happy to be parents and I am sure my two friends are happy to their newborn child. Wish the best health for their babies and to all moms out there, you can join the Baby and pregnancy forum at babiesbase.com, you can learn a lot of things about baby and pregnancy. You can share your experience and opinions to others. Visit and join the forum at babiesbase.com! I already send the box for my family and they probably get the package at the end of May or first week of June. I am sure they will be happy with it. Actually I was thinking to buy cigars for my brother in law because he is a smoker but I decided not to. Smoking is not good in his health and instead of buying cigars, I bought them a nice watches. They will absolutely like those watch and hope they will appreciate all the things I put in the box. Debt collectors often have a bad reputation. Many of them under handed methods to try collect money from you even illegal tactics. So many times there reputation is deserved. When you borrow money to a wrong person or a company where they use this kind of methods, harassing and hurt people just to get the money you owe from them. You might need help from creditlaw.com, they will help you with this matter. I watch Korean dramas and sometimes they show what debt collectors do if you won’t pay them back. Either they will threaten you and your family, they will use illegal tactics just to get what they want. If you experience debt collector harassment, abuse and deception, this is your opportunity to get help from credit law. Learn what the Fair debt collection practices ac and get a free legal help from them. You can submit free case review directly to their website. So be protected from unfair and deceptive debt collection practices at the credit law or call this number at 1-800-668-3247. I can’t believe that Dana still sleeping until now. I bet she is worn out when we have our family service this morning. The weather this morning was fine, it was just very windy but at least not chilly. Dustin and Dana enjoy going out on service. They love to ring the door bell. That’s their favorite thing to do, It’s part of their job. Dana enjoyed it a lot and she always say “nobody’s home mommy” but when somebody’s home, she says hi to the householder. When we get home, we changed our clothes right away and go to the store for our grocery shopping. Dustin never stop saying “I want to buy 5 hot wheel cars mommy”. So we bought him his favorite hot wheels cars and now his happy. Who wouldn’t want to own an iPhone? IPhone and iPad is one of the latest technology right now that most people wanted to get. Actually my niece ask me to buy her an iPad so that she can use it in her studies. Well, I am not sure yet, the price are rocketing right now, way too expensive for me that’s why I don’t want to buy one for myself. Someday, I will probably get one. How about the Apple accessories? The accessories seems very affordable and if ever I will get an iPad or iPhone, at least I already know where to buy apple iPhone accessories. Dustin got her physical check up this morning as well as the vision check up. It went pretty good but when he try to read those letters and pictures a little bit far, he’s having hard time reading those letters. Instead of saying stars, he says it’s a dot, when she point the moon, he says its an L. So the nurse give us a recommendation so that Dustin can take another vision test. For me, its normal not to see those small letters and photos clearly in distance. It happens for me before when I have my vision examination. So instead of buying a prescription eye glasses, I insist to buy a cheap eyeglasses because I don’t think I need those reading prescription glasses that time. As long I can still read at night and have a clear vision. That is all that matters to me. I'm not the best at planning out meals. I'm great at figuring out what to fix for the entree and how to fix it. It's just that when it comes to the sides, I can't really put good stuff together. I'm not sure how that's beyond me, but it just is. So I take a lot of cues from reading online cooking blogs to figure out what goes well together. I'm getting better at it little by little. But one thing that isn't past me is that you should serve bread with Italian dishes. Most of the time I just make some garlic toast with it, but I decided that I try fixing some other kind of bread to go with Italian dishes. When I was online trying to figure out how I could do that, I came across the site http://www.getclearwirelessinternet.com/ and after I looked through it a little bit, I decided to sign up for the internet service. Then I found some directions on how to make a garlic knot and thought that it would be a really nice way to challenge myself. They didn't turn out as great as the ones that I've had at restaurants, but they were still pretty good. I personally think it is time to just go ahead and accept the fact that the Super Bowl has become a day of national celebration. They should go ahead and formalize the deal and make the following day a national holiday. Our nation has watched a trend that began with congregating in small groups to watch the game grown into ever more formal parties. Party goers consume massive quantities of chips, dips and finger food while guzzling beer. We watch and cheer for the commercials, desperately consult the office pool and every once in a while glances at the game. When it all winds down the idea of dragging our engorged and suds soaked carcass into work the next day is so insane another trend has grown; calling in sick on the Monday after the game. I am planning a quiet Super Bowl Sunday this year. I expect the game will be an interesting one with two old line teams that have mobile quarterbacks and great defenses. I know that I can see the game better than ever on my new big screen HDTV with its crystal clear picture delivered by DIRECT TV. A friend or two may pop over, but until they make it a national holiday for real I plan on keeping it simple.